The latest ostentatious construction project in Turkmenistan is reportedly complete. 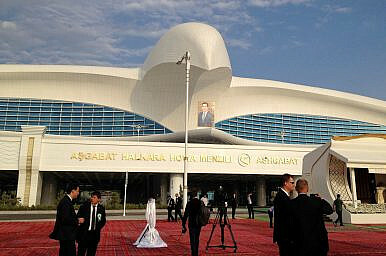 Ashgabat opened its shiny, falcon-shaped airport last weekend. It’s white, of course, and probably marble. The airport–which reportedly comprises 190 buildings spread across a 1,200 hectare site, with facilities to handle both people and cargo–cost a whopping $2.3 billion. The terminals, authorities say, will be able to serve 17 million passengers a year while the freight facilities are equipped to manage 200,000 tons a year. Looking at a map, Berdymukhamedov isn’t wrong; but while Turkmenistan looks perfectly positioned to be a bridge the country doesn’t make it easy for business or travelers to use Ashgabat as a bouncing point. Turkmenistan has constructed the bones of a freight and transit business and a tourism industry–there is a $2 billion project to upgrade the port at Turkmenbashi and a “tourist zone” at Avaza, complete with Dubai-esque resort hotels (also in fun shapes, like a cruise ship). According to the state tourism committee, however, in 2015 the country welcomed just over 100,000 tourists. As with other state-provided statistics, that number should be viewed with a degree of skepticism. Other sources are inconsistent on the matter. According to the World Bank’s incomplete data on tourism arrivals, in 2007 (the most recent year they have data for) Turkmenistan saw only 8,000 visitors. Before that, the World Bank’s database peg tourist arrivals at 300,000 in 1998. The United Nations World Tourism Organization has no data on tourism to Turkmenistan in the last five years. In contrast, the UNWTO’s latest data for Kazakhstan says in 2014 more than 4.5 million tourists passed through the country and Kyrgyzstan saw more than 2.8 million tourists in 2014 (in both cases, these were declines from 2013’s numbers). The latest UNWTO data for Uzbekistan, from 2013, says the country hosted just under 2 million tourists that year. Tajikistan, with the most recent data, comes in last (except for Turkmenistan, of course) with just over 400,000 tourists in 2015. Ashgabat, even with likely-inflated state statistics, is so far behind its neighbors when it comes it tourism. One problem is the country’s daunting visa process. Turkmenistan requires a visa for all foreign visitors–most get five-day transit visas as a longer stay requires a state-approved tour guide. While Kazakhstan and Kyrgyzstan have visa-free regimes (15 days in Kazakhstan, 60 for Kyrgyzstan) for a number of countries, Turkmenistan requires even its immediate neighbors to obtain visas, with the exception of specific bordering regions in Kazakhstan and Uzbekistan.